Shire Country Services offer a wide range of amenity, equestrian and specialist agricultural contracting services across the North. Grassland maintenance contractors catering for the needs of customers with land areas ranging from large gardens to small farms. Relieve compaction, improve drainage and increase root development through grassland aeration. Make your event special with professional site preparation. Cut and stripe grassland and car parks. Supply and spreading of fertiliser for grassland across the North. 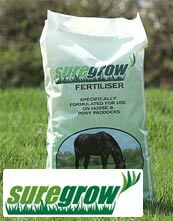 Stockists of Suregrow Horse and Pony fertiliser. Cut and collect grass and other vegetation. High-tip capability as well as scarifying large areas. Achieve a high quality lawn finish from powered cylinder mowers and ride on mower collectors. Suitable for many situations. Spring tine harrowing to promote healthy grass. Re-seed or over-seed your fields for better grass sward density, fewer weeds and improved grazing. Field margin, verge and hedge cutting contractors in North Yorkshire and County Durham. We have successfully undertaken a variety of landscaping projects over recent years. Getting rid of moss and preventing its growth. Heavy flat roller or Cambridge rolls for grassland repairing and improving grassland. Turning a building site or waste ground into a landscaped and cultivated space. Occasional or contract snow clearance and gritting services across North Yorkshire and County Durham. Domestic and commercial. Soil sample collection service, analysis and advice. Test your soils for pH, fertility and available nutrients. Quality dry seasoned hardwood logs and more delivered across Hambleton, Richmondshire and County Durham. Felling, thinning, pruning and planting services. Redeveloping old wild flower meadows and creating new wild flower areas.